Burgers, Burgers, Burgers! Blame it on the weather and the fact that I have a bunch of ground pork – which, by the way, grills up to a very moist and delicious burger. We’ve been getting our beef burgers from Kuma’s and I don’t dare try to emulate perfection! These burgers have been around for about our last five summers and started out using ground turkey. But like I said – I’ve got a lot of ground pork and I’m glad because it’s really better suited for grilling. I’m not sure where the recipe came from – I think maybe RecipeZaar, but I can’t be sure. All I know is that they’re DAMN FINE! Then make into six equal sized patties. Pan fry or grill until internal temperature is 165°. About 7-9 minutes on each side. Top with Tzaziki Sauce, serve on bun. OMG I cannot wait to try this. I always have ground pork in the freezer and yet I’ve never thought of make burgers out of it. It looks SOOO good!!! I have to try it!!! These look fantastic. I don’t often get ground pork, but I bet they’d be phenomenal with ground lamb. Agreed — bet these would be absolutely killer made with ground lamb! I love a good Greek burger. Pass lots of tzatziki, please! Looks great! Wonderful twist on a burger. Will definitely have to try these! 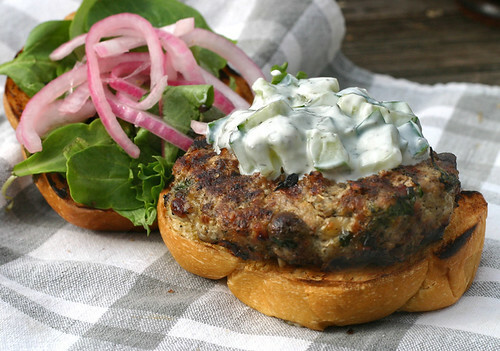 I love lamb burgers, bury some ground rosemary in with the lamb! These would be fun made into little meatballs and served as “sliders” at a party….will have to give them a try. I was just about to say the same thing as Debi, this burger would make fantastic sliders at a party. Your picture is fantastic. Mouthwatering! I’ve saved this for the next time I grill. Love Tzaziki….it’s a must-have item in my kitchen. oh, what a fantastic lookin’ burger! i love the sauce as well! I love the feta twist, it must add such a nice flavor, great idea! The flavors look great. I think I can even veganize it.. yumm! That burger looks good! I like a nice greek themed burger. I just wanted to tell you that my family is in LOVE with these burgers. Tonight is our second time in a week making them! I used ground turkey and made sliders. Delicious!!! I’m so glad! Thanks for stopping by to let me know! Next week we’re going to have a burger a day – so you’ll have more to add to your repertoire. Made this burger, left off the onions since I allergic….absolutely wonderful will make again and again thanks so much! Glad you liked it – thanks for stopping by and letting me know! SO SORRY you’re allergic to onions – I always say they are the backbone of cooking. nice, would definately have to make it with lamb though!